Clem Timmins has lost everything, her clothes, her possessions, her house and her mum. Now living in a tiny flat with her dad, Clem has to start a new school and make new friends. On her first day, Clem tells Ellie that her mum died in a house fire and immediately regrets it when Ellie latches on and confides that her own mother is dying of cancer. When Clem receives a letter she doesn't want to read, it becomes clear she can't run from her past forever, especially when the truth appears right in front of her face. The devastating inferno consumed their home, the charred remains a reminder of what eleven year old Clem Timmonds has lost. Her home, her possessions and irreplaceably, her mother. Now living in a small one bedroom flat, Clem's father sleeps on the couch and provides for his daughter with the meagre, second hand possessions donated and bought. While her horticulturist father plans to return to work, Clem can no longer attend her former school with her best friend Bridge and enrols at her new school, anxious at the thought of making new friends when popular Ellie is asked to show Clem her new surrounds. Clem is adamant she won't talk about her mum but finds herself sharing her story with Ellie, about the fire and her mum who is no longer around. Ellie understands, her mother has cancer and the two new friends connect through their shared grief. Clem is a wonderful young lady, intelligent and aware, a beautifully gentle girl who is summoning her bravery after the devastation of losing her home. The parental relationship with her father is loving and gentle, he only wants to provide for his daughter and ensure she is happy and safe, going without to make the transition easier. Although he becomes frustrated with Clem's refusal to listen, he's patient and understanding of the emotional toll this has placed on his only child. I enjoyed Clem's friendship with her new neighbour Maggie, a lovingly quirky woman who also understands feelings of isolation and that tea and cake can also open the lines of communication. Maggie also provides Clem with a sense of responsibility by asking Clem to tend to her fish while she's away. Maggie's flat becomes a safe haven for Clem, who is encouraged to use the space as a means to escape for quiet reflection. 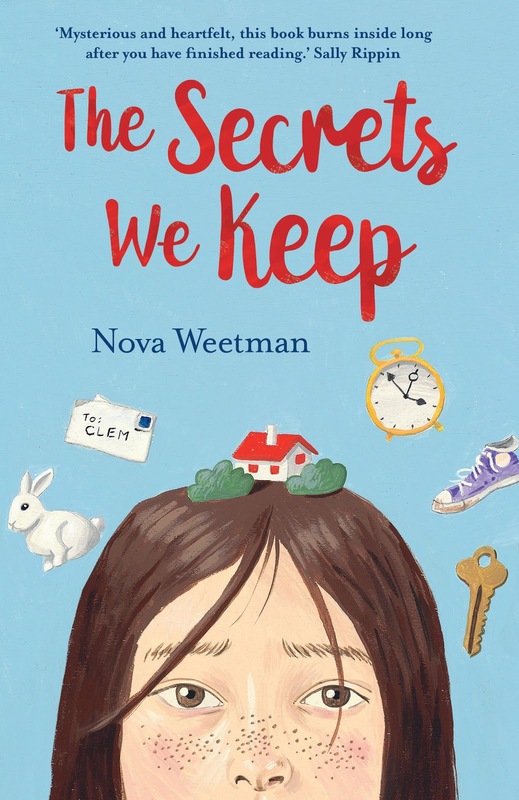 Starting a new school during the school year is often a nervous time for most children, Clem is fearful of not being able to make friends and longs for her best friend Bridge and the warmth of her Chinese Australian family. Clem meets Ellie and friend Tam. While Tam doesn't hide her disdain, Ellie and Clem become friends through their shared grief and love of track athletics. Ellie is a lovely character enduring tragic circumstances. Her mother has cancer and she gravitated towards Clem needing a sense of camaraderie and understanding but inadvertently, leaves Tam behind. Grief does bind people together when they most need it, doesn't it? What a beautiful friendship between Clem and Ellie. Also, I like her relationship with her father -- I think that's an important one in this context, and I guess that I'm a little bit too tired of YA not giving parents their due. Me too Verushka. Parents are an incredible influence on our lives and especially during those adolescent years. Of course not all parents are positive influences or present in every child's life but it's time young adult begun to include parental characters as part of their narratives, something we can boast that our Australian young adult includes. This does sound very engaging and I like what you're saying about all the relationships she has to work on or build in her new circumstances. I loved the message of forgiveness and new beginnings Sophia, it was really lovely. Looking forward to reading the sequel very soon! Oh gosh, the beginning of this one sounds absolutely heartbreaking, but it looks like it's a book that slowly turns into a hopeful one. I love the message of kindness and forgiveness too. It was beautiful and also touches upon mental illness, separation, post trauma stress, single patenting. It's subtle and really lovely. I've been trying to avoid sad books lately, and this one sounds like it would crush my heart. I'm glad you liked it! I'll add it to my TBR for when I'm in the mood for emotional and heartbreaking. It's ultimately about hope and learning not only kindness and forgiveness but also from our experiences. I would love to see what you think of it! My first instinct is to say that this book sounds absolutely adorable but I feel like that adjective doesn't quite fit given the issues the book deals with. I am glad though that there are books for younger readers that take on heavy subjects because people tend to underestimate what younger kids are capable of handling. I am so glad you liked this one, Kelly! I am just gonna sit in my corner and continue being sad that I don't get to read half of the amazing #ozya books because the pubs here don't want to buy the rights to beautiful gems. The world is truly missing out. You can find most titles on The Book Depository too I believe. Most authors with their own children or that are very aware seem to write age appropriately and also to challenge children and early adolescent readers. I've read a few over the years where authors haven't understood their audience and it can come across as being condescending. Australian authors always seem to find that wonderful balance. This book sounds so sweet! The friendship in this one sounds so refreshing and genuine though, despite the grief that the girls are going through. Lovely review! Thanks Aila. Another aspect was how genuine the relationships between the characters were. It was lovely to read. I've never heard of this book before but now that it's on my radar, I'm gonna have to check it out. It sounds so refreshing and relatable, whilst managing to discuss some more mature themes to a younger audience. Great review! It's so lovely Sunny. Nova Weetman is such a wonderful author, I think you'd really enjoy her work. The cover is adorable isn't it Vanessa. Such a poignantly beautiful read. Looking forward to the sequel. Oh man, that would be a tough situation. Glad this turned out to be such a lovely book. I like being aware of books like this so I can recommend them to certain people who could benefit from it. It's one I would recommend for mature middle grade and early teen readers Christy, a wonderful read that even adults will enjoy. i like it, how it focuses on friendship rather than trying to fit in is one of the plus points! I think you would really enjoy this one Ailyn, I'd love to see what you think of it. Aw, this sounds like a really lovely book. I like the themes throughout, and Clem seems to be a really realistic well-done character. I do like to read MG novels and I should probably check out more. Thanks so much for the recommendation and the fantastic review! This would appeal even to early young adult readers too Lauren, such wonderful themes of family, love and forgiveness. The relationships sound wonderful. And I know I always says this but you find the most beautiful covers! It was such a pleasure to read Karen. It's such a special read. I've actually just begun the companion novel, The Secrets We Share and it's beautiful. Such deep, thought provoking middle grade that's beautifully written. Oh Wow, this sounds absolutely beautiful! Loved your review. I've just started reading the sequel and love this series so much Sarah, would love to see what you think of it.